PC Devices pre-installed with Windows 10 are still only trickling through Western Europe’s IT distributors in week one after the operating system’s release. Following the launch week where around 150 unit sales of Windows 10 Home based notebooks were recorded, a similar number have appeared in the channel in the first week after launch. In the lead up to the release of the new OS, Microsoft’s publicity spoke of a phased adoption with an initial upgrade phase to be followed by another, going into the fourth quarter, when OEMs are expected to bring out more Windows 10 devices. The decision to delay the release of the OS to OEMs and to offer consumers a free upgrade means that the range of such systems is much smaller than that which accompanied the launch of most earlier versions of windows. 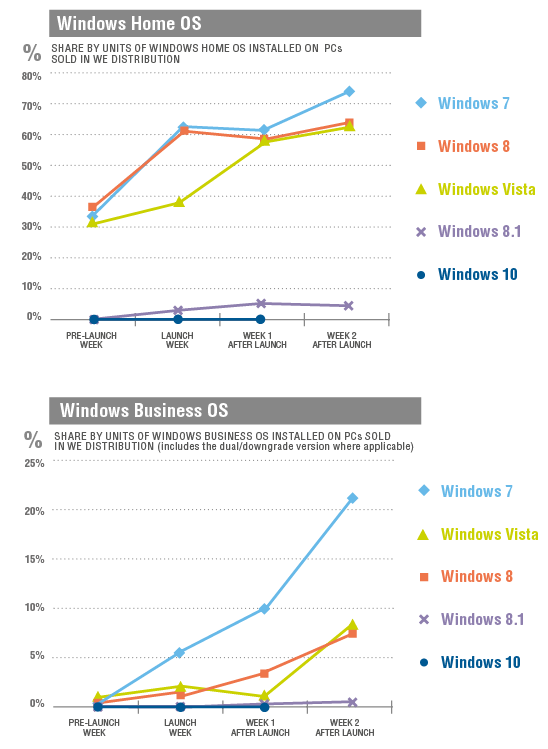 In 2007, Vista was pre-installed on 57% of new Windows Home PCs sold by distributors in the first week after release, while Windows 7 made it to a 61% consumer share and Windows 8 to 58% in comparable weeks in 2009 and 2012. Adoption of the Business version of all of Windows 10’s predecessors was slower, although Windows 7 was preloaded on 10.2% of Windows business PCs in the week following that of its 2009 release.